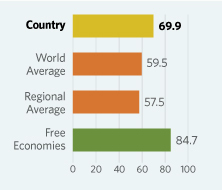 Korea has an excellent ranking in business freedom and a mediocre ranking in all other major categories. There has been no major change in Korea’s ranking for many years. The complete report can be found at the Heritage Foundation.